That the Blessed Virgin Mary remained a virgin her entire life is a De Fide (required of the faithful) doctrine of the Catholic Church. See Documents of Vatican II (LG57), Catechism of the Catholic Church, 499, The Mother of the Redeemer, 39 (Encyclical Letter of Pope John Paul Il, 1987), and Ludwig Ott, Fundamentals of Catholic Dogma, pages 203-206. Celibacy for the sake of the Kingdom is a radical feature of Christianity, and finds its biblical mandate at Matthew 19:12. Jesus, in fact, “is described” and “sees his own self identity” as that of the “celibate bridegroom” (article by Janet Smith; see also John 3:29 and Matthew 9:15). Paul presents celibacy as a highly favored state of life for believers saying, “I wish that all were as myself am [celibate]. But each has his own special gift from God….” (1 Cor. 7:7). Paul confirms the goodness of marriage at 1 Cor. 7:38 saying, “He who marries does well,” but then adds that “he who refrains from marriage will do better.” Mary embraced both marriage and celibacy, thus exemplifying in a unique way the sublime dignity of both vocations. Mary is properly to be considered the spouse of the Holy Spirit since the Holy Spirit “overshadowed” her and was the formal cause of her virginal conception of Jesus (Luke 1:35). This is why her offspring, Jesus, “will be called the Son of God” (Luke 1:35), and this is also why Mary is properly called the Mother of God according to the decree of The Council of Ephesus in 431. Mary’s unique and “supernatural maternity” through the power of the Holy Spirit necessarily precludes her from intimate union with a man. Mary is a virgin because of her “undivided gift of herself” to God (Catechism of the Catholic Church, 506). 5. DID JESUS HAVE BROTHERS? “It is often alleged too that such verses as Mark 6:3, “His brethren James and Joseph, and Judas and Simon,” and Matthew 13:55- 56, “his brethren James and Joseph, and Simon and Judas,” are evidence that Jesus had brothers and sisters. What is forgotten is that the Jewish expression for brothers and sisters applies to cousins and even to people in the same tribe. Although Lot was the son of Jjraharn’s brother Aran, he is described as Abraham’s “brother” (Genesis 14:14). Similarly, Jacob is referred to as the “brother” of his uncle Laban (Genesis 29:15). Similar examples are found throughout Scripture. In any case, in Matthew 27:56, Mark 14:40 and John 19:25, James and Joseph are described as the sons of Mary, the wife of Cleophas— thus Scripture tells us that the “brethren” James and Joseph in Matthew 13:55-56 and Mark 6:3 are not blood brothers of Jesus. If James, the bishop of Jerusalem, was truly a son of Mary it would be impossible for the doctrine of the perpetual virginity of Mary to be affirmed in the early Church Nevertheless, such ancient writers as Irenaeus, Polycarp and Ignatius all taught the doctrine as an article of faith.” (Robert Payesko. The Truth about Mary, page 2-198). The relevant verse is sometimes translated, “he [Joseph] had no relations with her [Mary] until she bore a son, whom he named Jesus.” The New American Bible translates the verse as follows: “He had no relations with her at anytime before she bore a son, whom he named Jesus,” This verse demonstrates that Joseph did not have sexual relations with Mary before Jesus’ birth, thus establishing the doctrine of Jesus’ virginal birth, The verse does not mean that Joseph had sexual relations with Mary after Jesus was born. “The Greek hoes [until] does not imply that Joseph and Mary had marital relations following Jesus’ birth. This conjunction is often used (translated ‘”to” or “till”) to indicate a select period of time, without implying change in the future (2 Sam 6:23 [LXX]; Jn 9:18; 1 Tim 413). Hers Matthew emphasizes only that Joseph had no involvement in Mary’s pregnancy before Jesus’ birth.” (Scott Hahn, Ignatius Catholic Study Bible, Gospel of Matthew, page 18). Mary is never called the mother of anyone else except Jesus in the New Testament. The Gospels refer only to Jesus as Mary’s son (the verses where Jesus is referred to as Mary’s son include John 2:1, John 19:25, and Acts 1:14). Further, as Dr. Scott Hahn points out, it is unlikely that Jesus would have entrusted Mary to the Apostle John’s care at his crucifixion if Mary had other natural sons to care for her (John 19:26-27). The Protoevangelium of James, written around A.D. 120, had as one of its principal aims to prove the perpetual virginity of Mary. Origin (died 254) strongly defended Mary’s perpetual virginity but Tertullian (died 230), who was excommunicated, denied it. Other early Church fathers affirming Mary’s perpetual virginity include Athanasius, Epiphanius, Jerome, Ambrose, Augustine and Cyril of Alexandria. Reference: Mary: Ever Virgin (This Rock: February, 2002) and Ludwig Ott, Fundamentals of Catholic Dogma, pages 203-206. Mary referred to as “perpetual virgin” by the Fifth General Council at Constantinople in 553. The first doctrinal formulation of this belief takes place at the Lateran Synod of 649 under Pope Martin I where Mary is called “blessed ever-virginal and Immaculate Mary.” Reference: Ludwig Ott, Fundamentals of Catholic Dogma, pages 203-206. 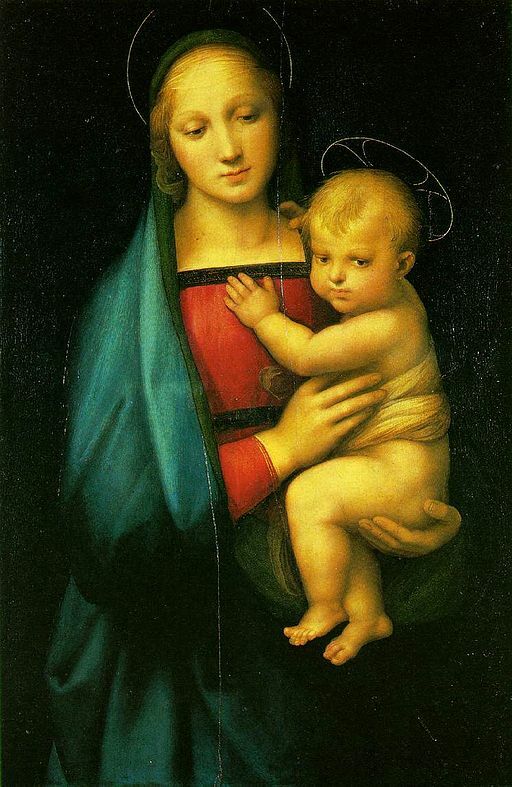 Image: Raphael, Granduca Madonna, 1505, Public Domain, U.S.A. (per Wikipedia).